Profemin Reviews - Is it a Scam or Legit? Taking two capsules of the Profemin supplement per day, the company claims its natural botanicals formulation can help relieve your menopause symptoms. 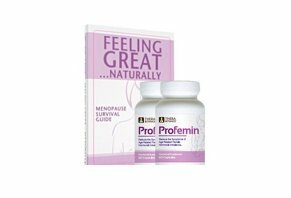 Profemin is a natural supplement formulated with an exclusive blend of botanicals the company claims can help effectively reduce and relieve the symptoms of menopause and perimenopause, without the use of hormones. Specifically, the manufacturer tells us that by taking one capsule of the supplement in the morning and another at night, women can help address their gynecological health, experience anti-inflammatory and pain-relieving benefits, and even improve their circulatory function. Their website indicates that Profemin was even shown in a double-blind, placebo controlled study to have provided “significant improvement in the major symptoms of perimenopause and menopause” for 96.6 percent of participants. Can you realistically expect to experience the same? That’s why you’re here, so keep reading and we’ll help you uncover answers to some of your most important questions. What Is Menopause & What Causes It? According to the National Institute on Aging, “Menopause is a point in time 12 months after a woman’s last period. The years leading up to that point, when women may have changes in their monthly cycles, hot flashes, or other symptoms, are called the menopausal transition, or perimenopause.” For most women, this occurs between the ages of 45 and 55. This 7-14 year transition is largely caused by greatly varying estrogen and progesterone hormone levels, which can decrease bone density and cause weight gain. As mentioned on the Profemin website, this can also potentially lead to additional side effects like lack of focus, decreased libido, sweating, moodiness, joint pain, trouble sleeping, irritability, fatigue, and low energy levels. Because of these varying hormone levels, one common treatment for the symptoms of menopause is hormone replacement therapy (HRT). While it can be effective, WebMD reports that common HRT side effects include a higher risk of breast cancer, heart disease, stroke, and blood clots. Can Profemin’s ingredients provide similar benefits as hormone replacement therapy, but without the potential risks? After reaching out to the company, we received a copy of a 2014 South Korean study involving 104 female participants with menopausal symptoms, between the ages of 40~70. The study lasted 12 weeks, was double-blind, randomized, and placebo-controlled, and occurred across more than one location. Note: While the supplement’s name used in the trial was EstroG-100, it contained the exact same ingredients formulation found in Profemin. To gauge the effectiveness of the supplement, participants filled out questionnaires assessing quality of life using the Kupperman Menopause Index (KMI), from baseline to week 12. Could Profemin’s Ingredients Cause Side Effects? Just because it’s advertised as natural, does this necessarily mean Profemin’s ingredients are safe? According to the clinical study mentioned in the previous section, the supplement’s proprietary blend did not result in any harmful side effects, which is however, like any other dietary supplement, it’s important to speak with your healthcare provider in advance. How Much Does Profemin Cost? TV Offer – Two bottles (60 capsules in each) and a copy of "Feeling Great Naturally – the Menopause Survival Guide" for $9.95 S&H. After 30 days have passed, you’ll be charged $39.95 per bottle ($79.90 total). Every 60 days thereafter, you’ll receive another two bottles and charged $79.90 each time. Best Value Offer – Two bottles (60 capsules each) and a copy of "Feeling Great Naturally – the Menopause Survival Guide" for $34.95 per bottle plus $9.95 S&H (total of $79.85). Here again, after 30 days have passed, you’ll be enrolled in an autoship program, sent a fresh supply every 60 days, and charged $79.90 plus $9.95 S&H each time. Good Value Offer – A one-time, 30-day supply of Profemin for $59.95 plus $9.95 S&H. No recurring shipments thereafter. The supplement’s commercial advertises the ability to purchase a 30-day supply of Citratrim, the company’s fat loss supplement, for an additional fee. According to the representative we spoke with, Profemin comes with a 30-day refund policy, less S&H charges. Customer support can be reached at 800-221-0905 or customerservice@profemin.com. What’s the Deal With Profemin’s Arbitration? Per the terms listed on the supplement’s website, all direct sales of Profemin are bound by an arbitration agreement. What’s this? In a nutshell, it means that if you have a legal issue with the company, you agree to bypass the courts and settle the dispute via binding arbitration. While this is extraordinarily common in today's marketplace, as consumers ourselves, we feel it's worth emphasizing. Are Customers Leaving Positive Reviews For Profemin? Since performing our original research, 15 HighYa readers had provided feedback about Profemin, giving the supplement an average rating of 2.5 stars. Most compliments appeared to revolve around effective results (e.g. decreased hot flashes, improved sleep, reduced sweating, etc. ), while many complaints related to no results and unknowingly being signed up for recurring shipments. With this said, the autoship details on the site seemed crystal clear at the time of our research. On Amazon, more than 120 customers had given Profemin a similar average rating of three stars. Many referenced the same compliments and complained about no results, although no mentions were made about recurring shipments. From a company perspective, Profemin is brought to you by Thera Botanics, a popular manufacturer that also makes Prosvent and Cebria. Under the Profemin name, they held an A+ Better Business Bureau rating and three closed complaints as of 8/9/17. Only one of these complaints provided details, which referenced fraudulent charges. The company seemed to respond quickly with a solution. How to Choose a Menopause Supplement? Searching online for menopause supplements returned hundreds of results through Google—and while none contained the exact same formulation, many contained some of the same ingredients and promised to address the same side effects. Some of these options were priced as low as $6, while others exceeded $50, putting Profemin’s per-bottle price somewhere near the middle (depending on your ordering choice, of course). How can you make the most informed decision? Starting out, it’s important to emphasize that according to many prominent health organizations like the National Institutes of Health, dietary supplements are not recommended for otherwise healthy individuals (i.e. those not deficient in any of the ingredients they contain). And since menopause isn't considered a disease or deficiency, this means that it’s important for you to speak with your doctor about any supplement’s real-world potential to ease your symptoms. Speaking of which, another important consideration is that even some of the most popular natural ingredients used for menopause relief, such as black cohosh, dong quai, evening primrose oil, ginkgo, hops, red clover, soy, St. John’s wort, vitamin E, and wild yam are reported to have insufficient (or inconclusive) evidence for their effectiveness. In fact, only ginseng is reported by Health.com to have the potential for addressing menopausal symptoms, although it can cause some serious side effects in women, such as heart problems. Let’s carry this thought over to the final section. What’s the Bottom Line About Profemin? In the end, like any other dietary supplement, there’s no way to know if Profemin will work with your specific biology without giving it a try. However, the company provided us with a copy of a clinical study that found the supplement’s specific blend of ingredients has been shown to significantly reduce self-reported menopausal symptoms. In addition, here on HighYa and on Amazon, the supplement had garnered a mostly positive online reputation with customers, and the manufacturer stands behind it with a risk-free 30-day trial, although you’ll be out a few bucks in S&H if you’re dissatisfied. Overall I liked Profemin, it worked for me in a lot of areas. Most of all it helped me feel myself instead of feeling confused or who I am. It controlled my mood swings and hot flashes, it helped with sleep. The price was a little high, but worth it for someone who doesn't have menopause that bad this would be good for them. Customer service is good. I ordered Profemin for the trial offer. They advertised that for shipping and handling of $9.95, you could get two bottles of the product. I received the product and a notice from my bank that Profemin requested $79.00. I called customer service and was told that the trail was not the full cost of the product. I told them I didn't approve of the selling tactic and wanted to return the product. I sent the product back and a month later the product was returned to me because there wasn't a "return code." I tried to use the customer service email and only got the (not sent) error. I tried to call customer service many times and can't seem to connect with anyone. Thank you for the review. We are sorry for any inconvenience. The trial offer is s/p upfront and the balance due in 30 days unless you contact us to return the product. We would typically not return an order without a return code so we definitely need to investigate this further. Can you please email marmstrong@idealliving.com with the name and zip code used when placing the order so we can find exactly what happened. I have taken two per day as directed for three weeks, and absolutely ZERO relief! Complete rip-off! The CitraTrim pill that you can add, also a rip-off. It doesn’t do anything for belly fat! I’m sending it all back for a refund and got a prescription from my regular doctor for 900mg of gabapentin per day that is taken at night, and it totally helps! It was $6 per bottle with my insurance. I recommend going to your doctor. Thank you for the review. We are sorry that Profemin and Citratrim did not meet your individual needs. It is a herbal supplement and everyone’s body absorbs at different rates and reacts differently as well. You might have just needed to take them longer, which is why we send a 60-day supply. We did receive your return and the pending delayed payment was canceled as well as future shipments. We are glad that you reached out to your healthcare provider to get what was right for you! I've taken this product for one year and I stopped because I was afraid of long-term side effects. So I kept my two full bottles for the month of November 2017, and on December 13, 2017 (one month later), I went into the hospital with kidney dehydration and was going into renal failure. My kidneys were at stage 3. We have no idea what caused it, and I'm not saying Profemin did it, and I'm not saying it didn't, we just don't know, so I'm afraid to take it anymore. It was a very scary feeling for me and my family to be laying in the hospital bed for 4 days, waiting for my kidneys to go back to normal and thinking I needed dialysis. But thanks to God, my kidney went from stage 3 back to stage 1, back to normal. So my question is, should I risk taking my last 2 bottles? Not being sure if Profemin caused my kidney failure or not, I wish I had the answer because I don't like these hot flashes. Please help me make the right decision. Thank you for the review. We are sorry to hear what happened to you. It would be best for you to discuss this with your healthcare provider to make sure Profemin is right for you. I've been using Profemin for about two months. After using it I haven't had any hot flashes and was able to do my daily routine without worrying about it anymore. I was also able to have better sleep in the night. I've been using Profemin for about a month now. Literally after the first use I haven't had any hot flashes and have been sleeping like a baby. I ordered through Amazon as I wanted to try first and I must admit that it is working great for me. I love Profemin. I've been taking it for 2 weeks now, and I fell so good. I used to have hot flashes every 45 minutes, I was so embarrassed when I was in public, my face dripping sweat and my makeup would be smeared. Thank God for Profemin. And it's natural. Even though I felt less severe hot flashes, I just canceled my subscription. I called to ask why I was charged on the 4th of Dec and again on the 29th. Was told if product was not returned within 30 days they charge you. Saying this is stated in the paperwork that comes with the product. I read to her exactly what my order form said and that nowhere does it state that. She was argumentative and rude. There are other products for a lot less to try. Does this pill really work? Someone help me. No it doesn't work so don't waste your time or money. Look into a supplement called DHEA. It worked for me. Thank you for the post. We are sorry that the 30-day free trial offer was not clear to you. The offer is as follows: You will be shipped 2 bottles of Profemin™, which is a 60-day supply. Profemin™ is yours to try for 30 days! All you pay TODAY is the $9.95 shipping and processing. Then, unless you call to cancel after 30 days, your credit card will be charged only $39.95 per bottle ($79.90 per shipment)! Every 60 days, we will send you a new 60-day supply of Profemin™ billed to your credit card at the same low price $39.95 per bottle ($79.90 per shipment) plus $9.95 S&P. You can stay on the program as long as you want and cancel at any time! And remember, all you pay now is just the shipping and processing! 30-DAY MONEY BACK GUARANTEE. It does help, but what is in there? I bought Profemin through eBay, paying a lot less. I took it for a couple of months and found my hot flashes and night sweats greatly reduced. However, I am rather nervous about the ingredients. I have developed severe headaches over the last few weeks and am wondering if these pills may be the cause. I have stopped taking them. "Proprietary Blend" can mean anything. What is really in there? I am not willing to take that risk. Hi Dorly. We're sorry that the ingredients weren't made clear to you. Here's more information on Profemin™, it is a dietary supplement that was formulated to utilize the synergistic benefits of three Asian botanicals that have been used for hundreds of years throughout Asia. Profemin™ is a patented blend of Angelica gigas nakai extract, cynanchum wilfordii extract, and phlomis umbrosa extract. Profemin™ is a safe, natural, state-of-the-art modern health solution for menopausal relief without the use of hormones. In addition, Profemin™ is a gluten-free supplement. I bought this and used it for two months. I took it to get rid of hot flashes and night sweats. It made them worse. I called the company and they said I was not giving it enough time. So took it another month. Then told them I would like to cancel. I still got a shipment on the tenth of March and was told it had to be back in there hands on the 21st. Also had to do all kinds of stuff to package to send back. But they were willing to offer me a 20% discount if I did not want to go through the hassle of sending it back! What a scam. I started taking this on December 1st and now into February, I'm still taking Profemin and never missing a dose. I'm not even seeing a small difference in my hot flashes or sleeping. As I'm writing this review, I'm getting hot flashes so in my opinion this product does not work and do what it was supposed to do. Please don't waste your money like I did. Write a Review for Profemin!